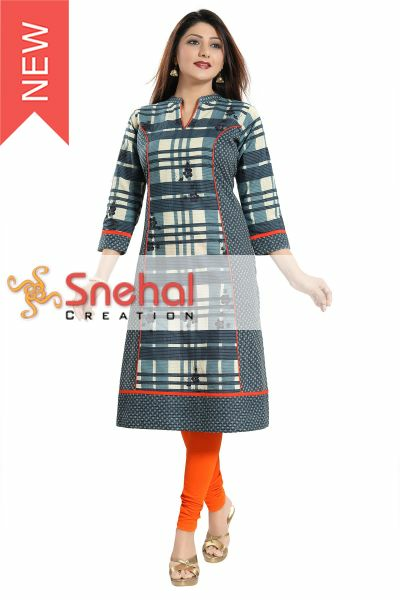 Snehal Creation - the new name for the Indian fashion world. As the generation changes the outlook of fashion also changes, a real designer is one who realizes these changes on time and make his products to cope up with modern trends. 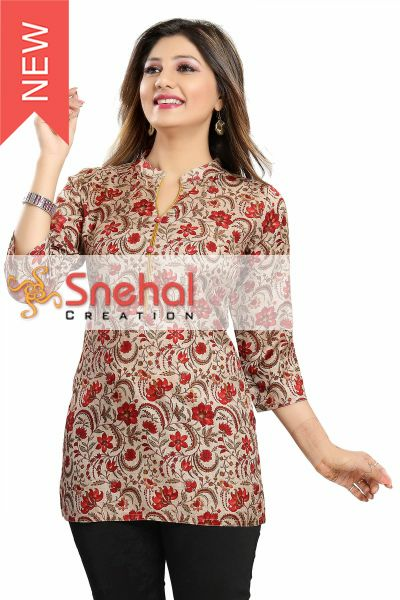 Snehal Creation has got wide varieties of Designer Indian Tunics and keep updates every day. Women's top, otherwise known as tunics is a modern name for the kameez. Salwar kameez were considered as traditional wear, where women tunics are more stylish. Women tunics are considered as causal wears which can wear with normal pants, cigarette pants or leggings. Indian Tunic Designs are most popular among college girls and women also. Women tunics can be paired with jeans and leggings. Well stitched Designer Tunics make them a shining star in any occasion. Long tunic is now worn over leggings, and we have a very good collection of leggings, patiala salwars and heram pants which includes almost all the colors and materials available. An Indian Fashion Tunic is a versatile wardrobe essential for every women. Tunics are suitable for casual wear as well as some dressier styles. Wear this tunic-top style over leggings, jeans or pants, depending on how casual you want the look to be. Tunics for girls are nice enough for school and parties, but comfortable everywhere. Women Tunics are available in long or short sleeves. A tunic can be worn in several ways to create fun and interesting styles. 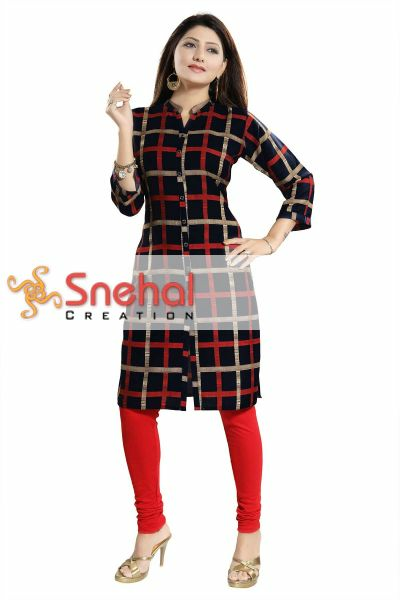 Visit www.snehalcreation.com today for all the latest tunic designs, along with the leggings, cigarette pants, patialas and accessories you need to rock the look! 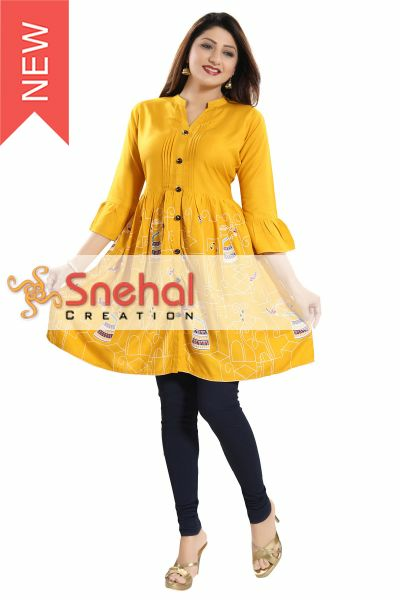 Snehal Creation includes most modern trends in bollywood and each tunic design is made under the supervision of our talented designers with full dedication. Indian Tunic tops for women includes long tunics, short tunics, designer tunics, printed tunics, cotton tunics, embroidered tunics. 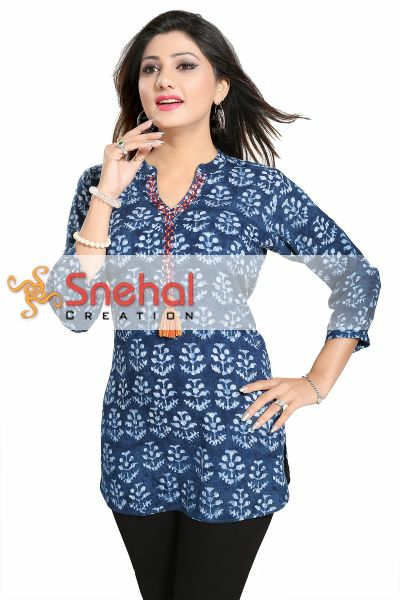 Our Tunics are made of variety of materials like Linen, cotton etc. are available in our gallery and you can choose which ever material you like from it. Each and every tunic style we have, is Indian made, but it has international quality and also it includes modern tunic trends without losing traditional touch. The dedication we are giving in tunic manufacturing enabled us to top among all other online tunic seller websites. Our designers are doing lots of research to bring newest tunic trends in clothing which suites all age groups. We provide plenty of women tunic designs, which are more affordable and easy to wear. The advantage of our tunics is that, they can be used in any occasion. Our collection includes embroidered tunic, Designer tunics, Beaded Tunics and Printed tunics. Not only the readymade tunics but also the material for salwars are also available in our website, and our designers can do custom designs on special request. We assure you that all our tunic designs are of high standard, and that is the reason why our tunic styles and patterns are in high demand across the world. We are marketing our products to international markets, and we are considered as one of the most reliable tunic manufacturer of women clothing and trendy designs. Our kurtis and tunic designs got recognized in the international markets.